This weeks picture is by one of my favorite artists Justin Sweet. His style is a similar to Frank Frazetta (like almost every fantasy artist) but he has a unique coloring and line style that is very striking. From what I know he works a lot on the computer using Corel Painter for illustration as well as traditional mediums. 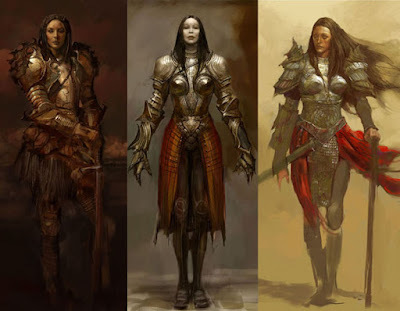 He has done the art for several video games including the old Icewind Dale game (a favorite of mine along with the Baldur's Gate games), and did several concept paintings for the movie Prince Caspian. The picture below is a simple concept picture, but I love the color and style. As much as I like chainmail bikini's I think this is far more practical attire for the female adventurer. Check out Justin Sweets website.